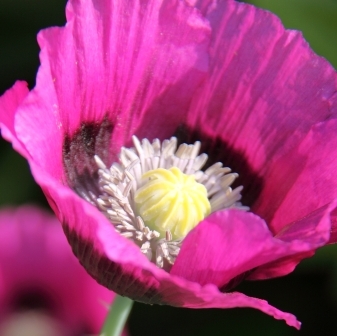 Patty’s Plum is an oriental poppy and a hardy herbaceous perennial. Given the right conditions… full sun or partial shade and fertile well drained soil… it will flower from June until September. It’s robust and very easy to look after but mature plants are tall – at around 80cm – and may need support, especially if your garden is in a windy spot like mine. Patties Plum has large flowers which are a fantastic dusky purple pink colour with a black splotches and a texture like crumpled silk. It’s fascinating to watch the plant produce fat bristly buds which open out into beautiful flowers over a few days. Poppies are brilliant for bees and other beneficial insects and you can use this particular one as a cut flower too. All you need to do is sear the bottom 2.5 cm of stem with boiling water for 20 seconds immediately after cutting then plunge into tepid water. The cut flowers last for a few days. 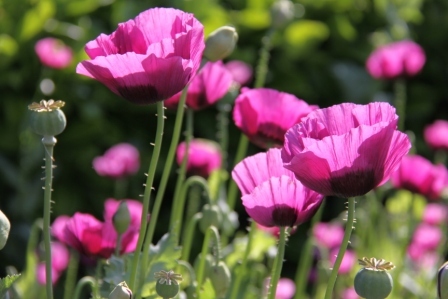 Do you grow poppies in your garden?